While most of these islands hold nothing more than bird guano, all three countries are vying for control of the rich mineral and oil deposits underneath. Also at stake are the shipping and defense rights associated with the expanded reach. The islands are uninhabited. Yesterday activists from China, Macau and Hong Kong staged a visit to the disputed lands. In Taiwan mass protests were also held to demonstrate that nation’s claim to the land. Another is being held now in Beijing. Yesterday also marked the 67th anniversary of Japan’s surrender in World War Two. Two Ministers in Japan took the day to visit Yasukuni Shrine to Imperial Japan’s war dead, which is a bitterly despised site to China as many war criminals are interred there. The high seas drama unfolded within sight of the islands. Japanese Coast Guard vessels intercepted the activist-laden trawler. One image shows two Japanese vessels conducting a pincer movement, ramming the ship to a stop close to shore. Several took to open water and swam to shore. They wanted to raise the flags of China and Taiwan on the outcroppings. Instead all 14 on board were arrested by Japanese officials and charged with immigration violations. If Japan were owners of the land then these people illegally entered Japan. Yet China doesn’t recognise Japan’s sovereignty over the islands. These were Chinese citizens on Chinese land. The 8 activists, 4 crew members and 2 reporters have all been transferred to Okinawa. Japan’s Prime Minister Yoshihiko Noda said they would be dealt with “strictly” according to Japanese law. Beijing and Tokyo summoned each other’s ambassadors to lodge formal protests. Hong Kong’s Chief Executive CY Leung summoned the Japanese Consulate-General to demand the immediate release and fair treatment of Hong Kong’s citizens. The use of a Hong Kong registered vessel allowed China to participate in the protest, without appearing to provide official backing. Sinophiles say a Chinese-registered vessel would have been seen as a serious escalation of the dispute. Activists under arrest. Protesters on the street. Harsh language from the Prime Minister. Midnight visits of Ambassadors. 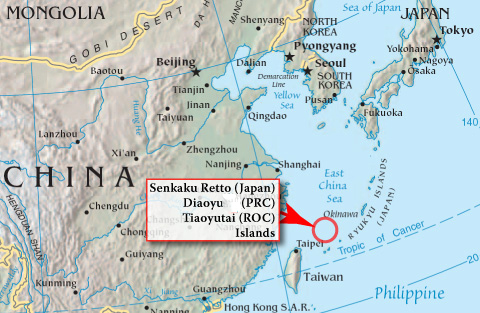 The Diaoyu Island dispute is front and centre in relations between Japan, China and Taiwan. And it will remain so long after these 14 activists are released. BTW … how long have you been living in Hong Kong? Returned a year ago – used to live here in the 1990’s. Was in Tokyo last week. What a great city! Was it your first time here?